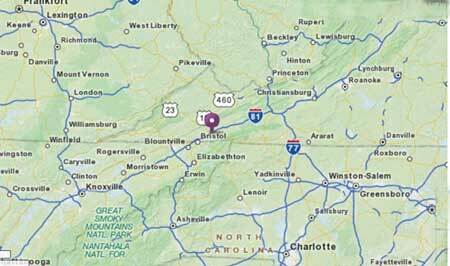 Abingdon VA rests in Virginia's Blue Ridge Highlands, nestled among tree-lined streets and brick sidewalks. Abingdon is home to the world renown Barter Theater and the Martha Washington Hotel. 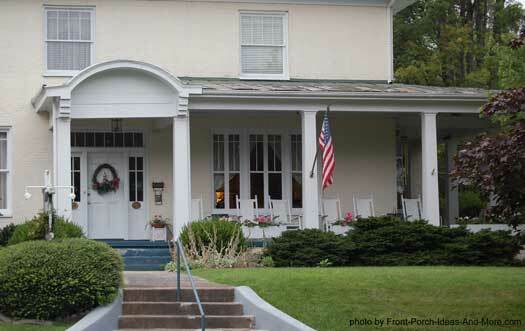 They are also known for their 19th century homes complete with beautiful porches. 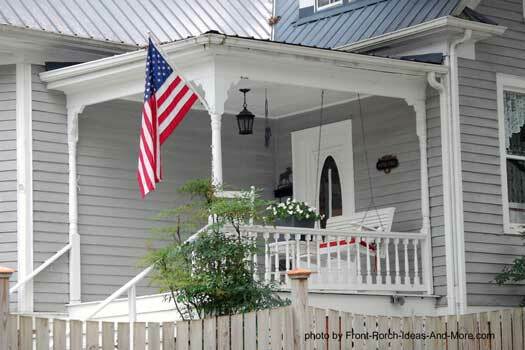 Mary and I discovered Abingdon during our travels through Virginia and wanted to share the wonderful porches we found. We love the clock and bell on the porch pictured above. The trim details at the corners make this porch very unique; we've not seen one like it before. That, combined with the column details, haint blue ceiling, and ceiling fan make this a very curb appealing front porch. Great ideas come in small porches. 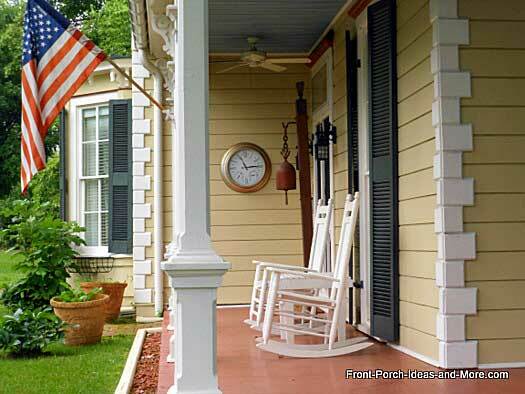 Simple porch treatments, the right color combinations, add a rocking chair and swing and you have a perfect porch! The columns on the porch above give it an almost delicate appeal. 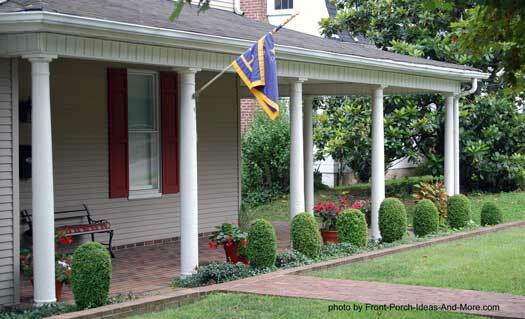 The column brackets help transition the smaller diameter columns to the porch ceiling. The hanging light fixture and red cushion on the porch swing give it a real comfortable feel. Most probably don't know that Abingdon was originally named Wolf Hills and later Blacks Fort. It wasn't named Abingdon (after Martha Washington's family home) until 1778. 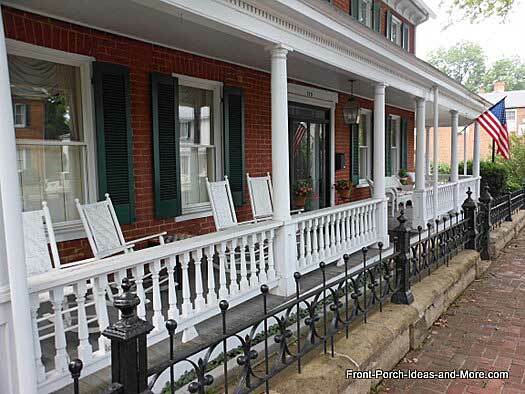 Rich in history, this small community boasts some pretty neat front porches. 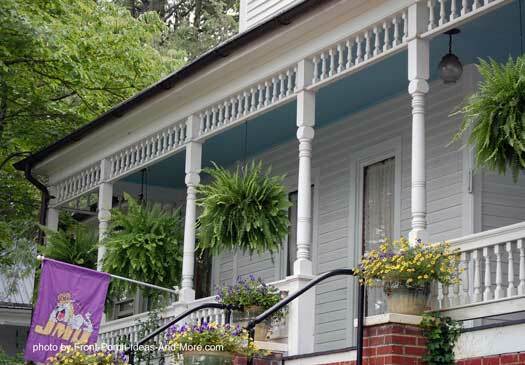 We found several wonderfully decorated porches with haint blue ceilings (a traditional color for porch ceilings). 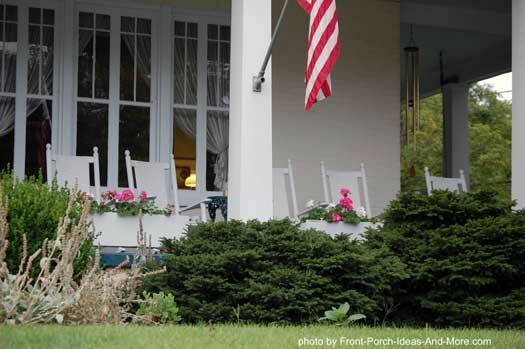 We like the outdoor decorative flag on the porch steps and the hanging baskets adorned with ferns. The arched gable over the front door makes this porch design one of our favorites. Placing a gable in this location defines the entrance and adds curb appeal. You normally can't go wrong with white furniture and complementary colors in your flower boxes. 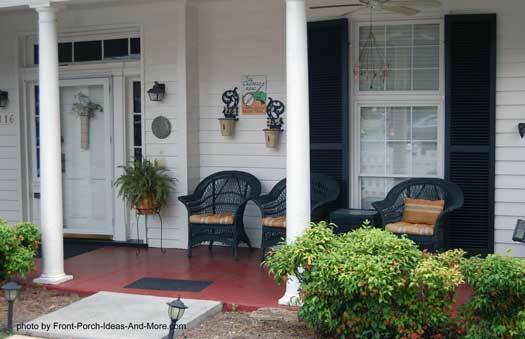 Easy to do and it makes for a comfortable looking porch. Wreaths on your front door are always pleasant. Use them for color or as a focal point. And they work no matter the season; change them out for holidays too. Black wicker is often sought after and it looks inviting on almost any porch. Add subtle landscaping and artwork to make your porch stand out too. The outdoor fan and wall sconces along with the sign add interest. Mary and I really like open porches and we saw several while visiting Abingdon vacancies. There is just something about them that appeals to us; perhaps it is the feeling of space around us that we enjoy. Note the brick floor and walkway - a real stunning combination. We like the tapered columns too and noticed the dentil-look on the beam above them. Note the shutters on the windows. Although this is a long narrow porch, the shutters against the white rocking chairs is a nice touch. This is a porch ready for a good game of checkers as you can see! 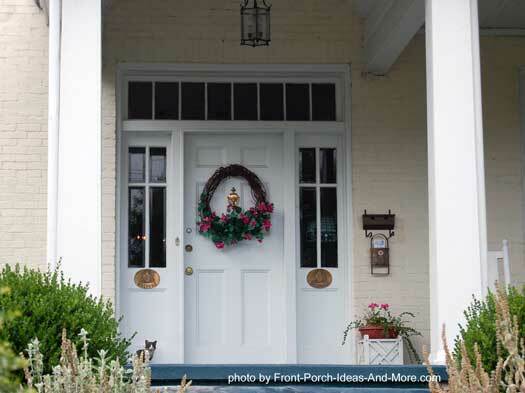 Friendly folks and welcoming porches - it doesn't get any better than that. We really enjoyed our stay in Abingdon VA and encourage you to visit one day.